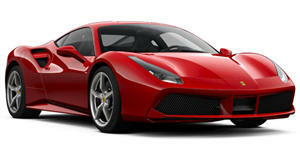 Ferrari's latest one-off is a modern interpretation of the automaker's most famous race cars. After showing off the new F8 Tributo at the Geneva Motor Show earlier this month, Ferrari has revealed the track-only P80/C as the company's most extreme one-off creation yet. Based on the 488 GT3 race car, the Ferrari P80/C was created for a client who wanted a modern interpretation of some of the most famous Ferrari Sports Prototype racing cars from the 1960s, such as the 330 P3/P4, Dino 206 S, and 250 LM that inspired many of Ferrari’s most iconic road cars. As you can see, the results are simply stunning. Work on the P80/C began in 2015, which is the longest development period of any Ferrari one-off yet. Every element of performance and aerodynamics was meticulously analyzed, which Ferrari says distinguishes the P80/C from previous one-off Prancing Horses. The P80/C’s unique design has strong and clear links to Ferrari racing classics like the 330 P3/P4, Dino 206 S, and 250 LM. The tinted wraparound windshield is a clear nod to classic Ferrari race cars, while the flying buttresses converging towards the roof make the glasshouse resemble a racing driver’s helmet visor. Not needing to adhere to road regulations has allowed Ferrari to replace the headlights with simple slits that recall the air intakes in the grille of the 330 P3/P4, while the gigantic, downforce-generating rear spoiler incorporates two taillights that look like air vents, mirroring the car’s front design. There’s also practically no rear bodywork, allowing the car’s running gear to be fully visible. A simple grille helps take heat away from the engine bay, and there’s also an aggressive rear diffuser. Elsewhere, the concave engine cover with aluminium louvres is a reference to the Ferrari 330 P3/P4. The bodywork is painted in a bright red called Rosso Vero, a name chosen by the client. Inside, the driver-focused interior has been stripped out and features Alcantara bucket seats along with six-point harnesses. Ferrari hasn’t released any technical specifications but being based on the 488 GT3 means the P80/C is powered by a 3.9-liter twin-turbo V8. The 488 GT3 was limited to 592 hp to meet category restrictions, so the P80/C should have at least 661 hp to match the road-going 488 GTB, or possibly even more power.